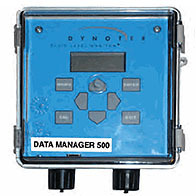 The 16 Bit Resolution inherent in Dynotek’s Data Manager improves overall accuracy of measurements by providing substantially better resolution of readings regardless of the underlying accuracy of the sensor input. This means that with a 1000 psi pressure transducer, the most accurately that actual water depths can be read with 12 bit is +/- 0.5 ft. With 16 bit resolution, changes in depth of as little as 0.04 ft can be measured. This level of accuracy can be critical in many monitoring and testing operations.